Remember playing those small, fun games on your new Windows PC? Minesweeper, Solitaire, Pinball and the like? Well Microsoft is taking it one step further with Windows 8. Now the preinstalled Games app in any Windows 8 editions and even Windows 8 RT device will come with access to not 5, not 10, but 40 games! And we’re not talking just about card games, there’s Angry Birds, Angry Birds Space, Pac-Man, Kinectimals, Fruit Ninja and many more. Supposedly, this is just the first wave of games with many more set to come by the end of the year. The Games app will keep getting updates and new games throughout the year. This bodes well for gamers! Even though these are mostly casual games, they will have all social features such as achievements, leaderboards and the like. Let the competition begin! 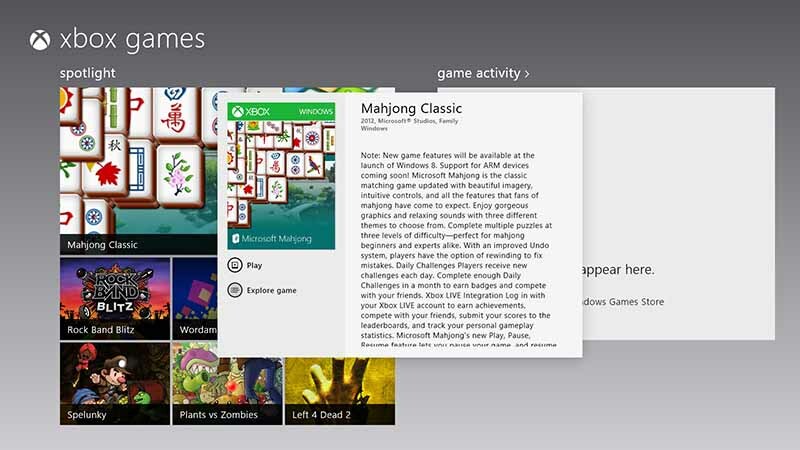 By the way, officially it’s termed “Xbox games for Windows 8”. Confusing, we know, but it’s gonna tie up with your Xbox Live/Microsoft Account to provide seamless integration. This looks like a perfect way to kill time while you’re listening to music or perhaps installing those larger games. Anyhow, here’s the list of Windows 8 games going to be released earlier. That list has some serious time killers, most of them need no introduction. So let the gaming begin, come October 26th! Do drop us a line about the Windows 8 games with your views, suggestions and queries. Any games you hope will be added? These are really some interesting games which are seemed to be far better than what we have seen in Windows 7 and the previous versions of Windows OS.